The UK's leading Megaflo range is now available in a new system format - designed to reduce significantly on-site installation time. 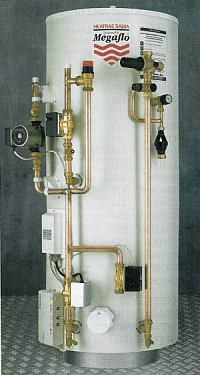 These factory assembled units are pre-plumbed and pre-wired with Smartfit central heating controls, pump, automatic by-pass valve and balancing valve. This new time-saving Megaflo package not only speeds installation but significantly enhances the quality and integrity of the central heating system thus eliminating on-site defects and costly call-backs. In addition to the basic advantages of unvented systems, Megaflo SystemFit offers a number of features that place it well ahead of the competition in terms of performance, quality and reliability.